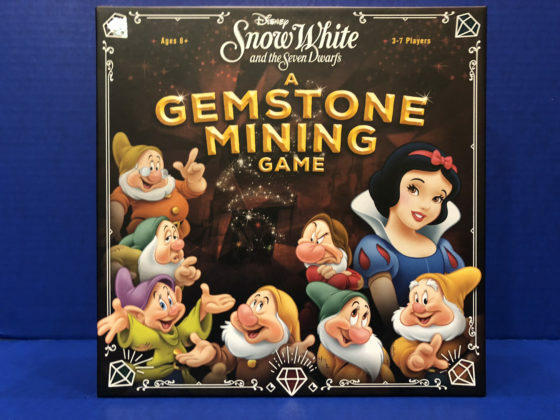 The world of Walt Disney’s Snow White and the Seven Dwarfs comes alive in a new board game for 3-7 players called A Gemstone Mining Game. 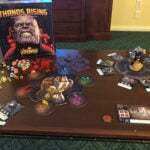 USAopoly has been producing some truly amazing board games recently, such as Thanos Rising. 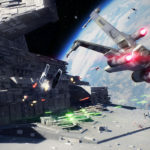 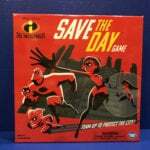 It’s rare to see such a well crafted game based on intellectual property that is over 70-years-old without any other tie-in to help sell it, such as a re-release of the film, which is part of what makes this game so special. 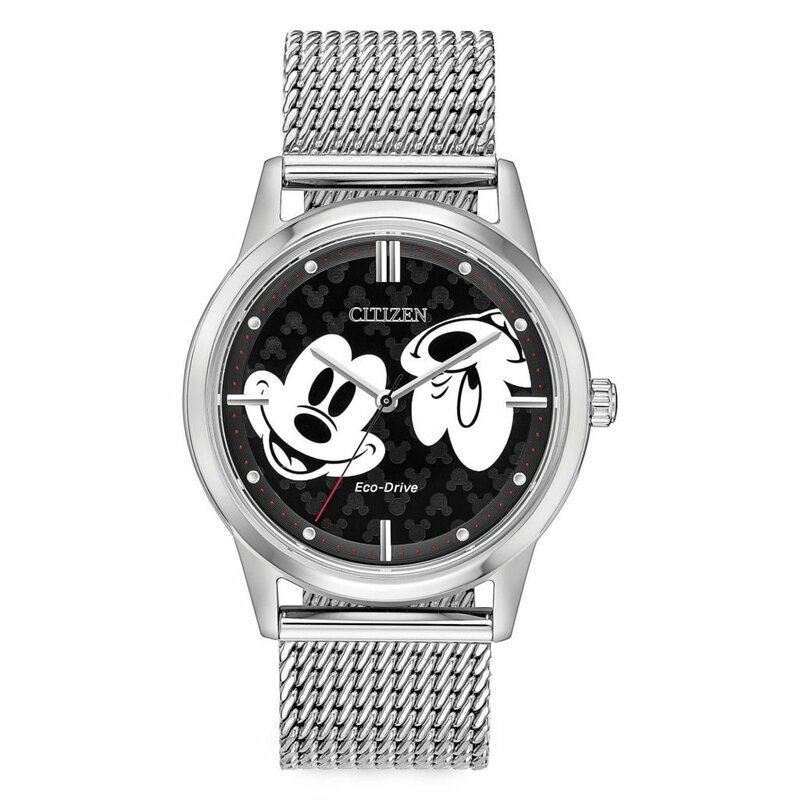 It’s based on a timeless classic that is eternally popular. 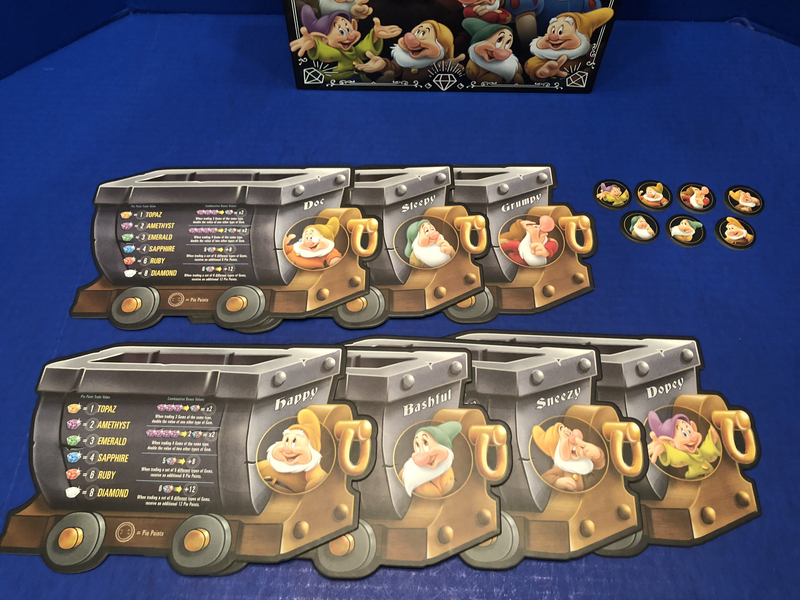 Players start by picking their dwarf and are given that dwarf’s mine cart (nobody gets to play as Snow White, so nobody has to fight about it). First player can be decided by either length of beard of the player, or if all players don’t have beards you can go with the shortest person. Players are dealt 5 cards, a mix of action and reaction cards, and they can play a card, select a gem, or leave the mine during that turn. 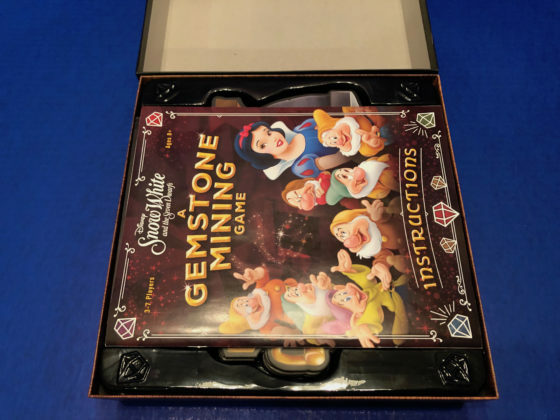 The main game board is small with room for a face-up Snow White Card, a marker to note the mining day, and dwarfs who have left the mine. 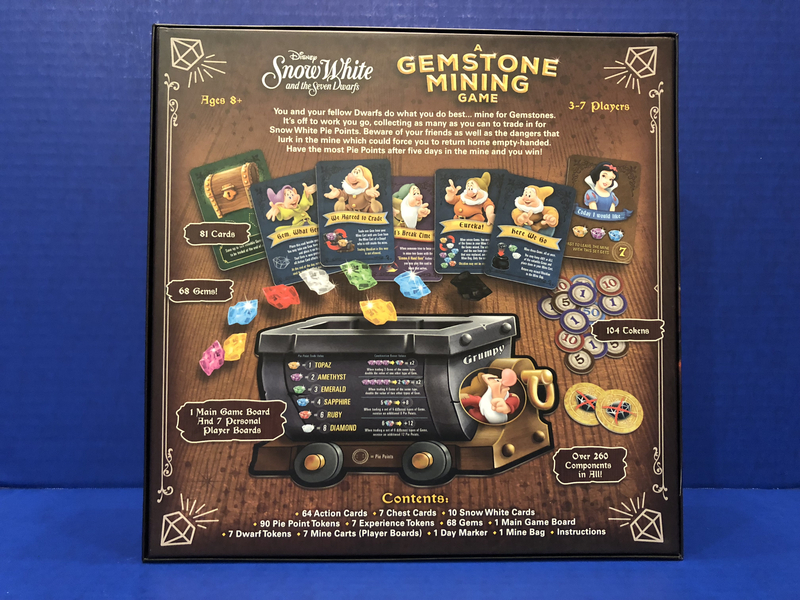 Players are spending 5 days in the mines and Snow White is asking for a specific combination of gems if the dwarves want pie points. 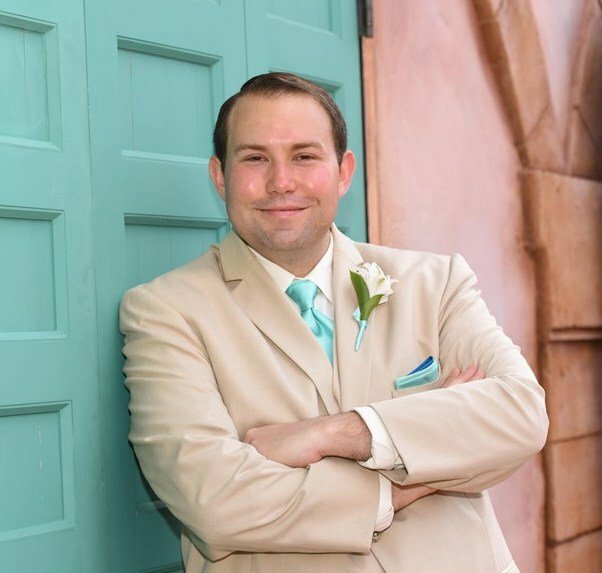 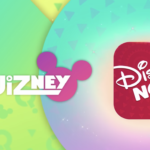 The objective is to match the gems and earn the pie points, which are only awarded to the first player to match the gems on each day. 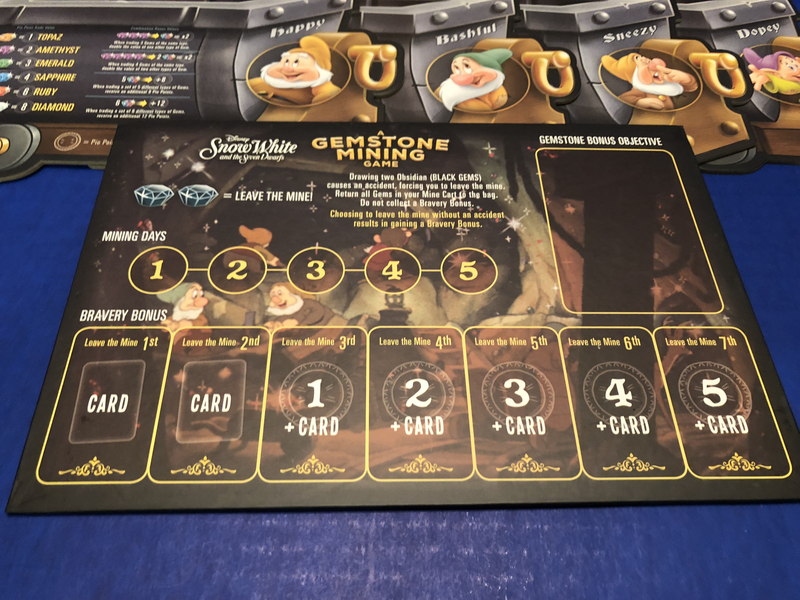 You can also earn pie points by staying in the mine longest and by trading in your gems at the end of each day. 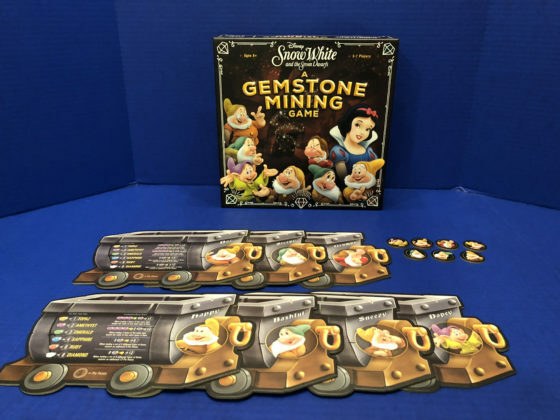 Each day lasts until all players leave the mine, which can be an undetermined amount of time before luck runs out. 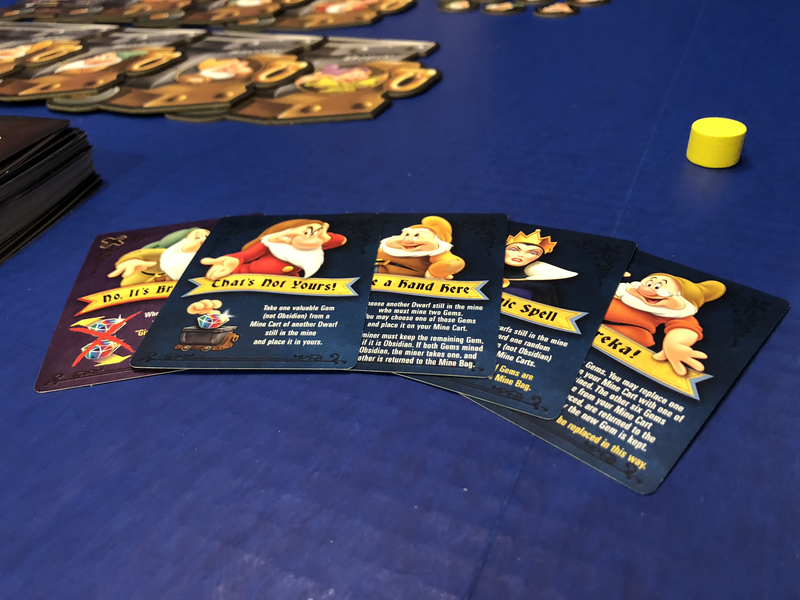 Players with the most pie points at the end of the game wins. There are seven different gems, each worth different values of pie points. You can trade in six of these gems for points and having multiples of them allows players to increase their value. 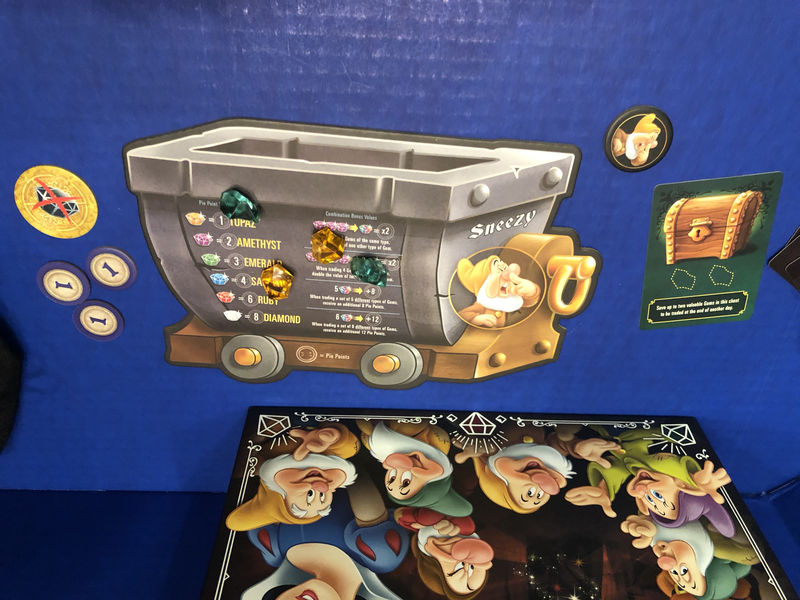 However, the seventh gem is obsidian and when players receive two obsidian gems, they are forced to leave the mine for the day and surrender their gems without receiving any pie points. It’s very similar to the black ring from Pretty Pretty Princess. You do NOT want obsidian gems! 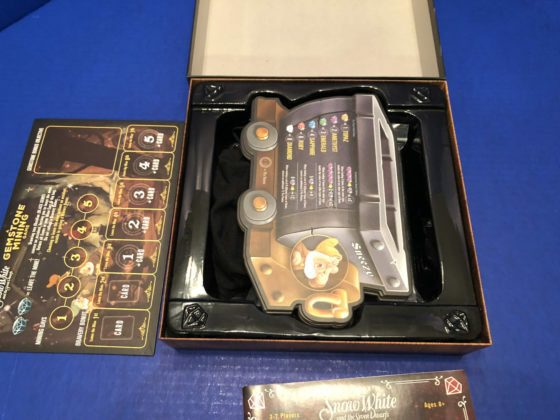 The game is recommended for ages 8 and up, but it’s actually a little too complex for most kids under 12. 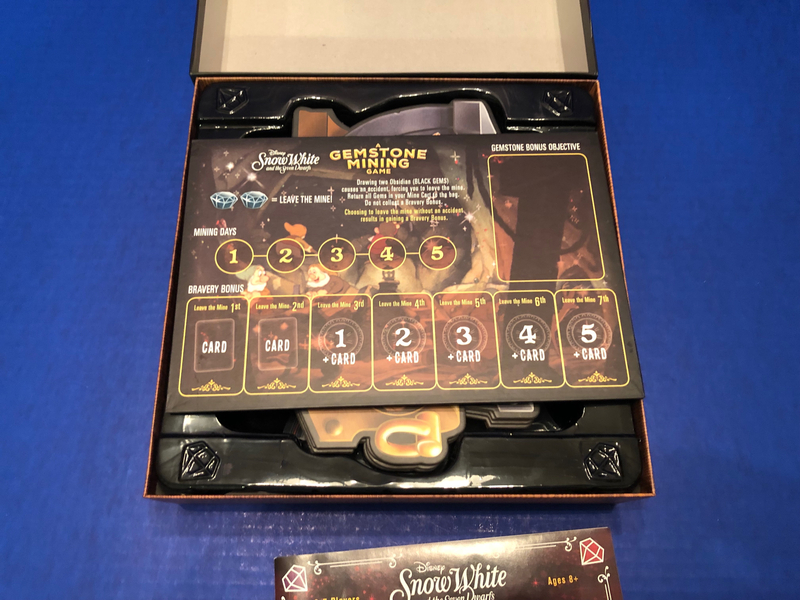 The instructions offer a simpler way to play, which removes “Reaction Cards” from the deck of “Action Cards.” These are easy to find as they are purple when face up and usually contain the ability to thwart your other players, making the game more difficult for them. 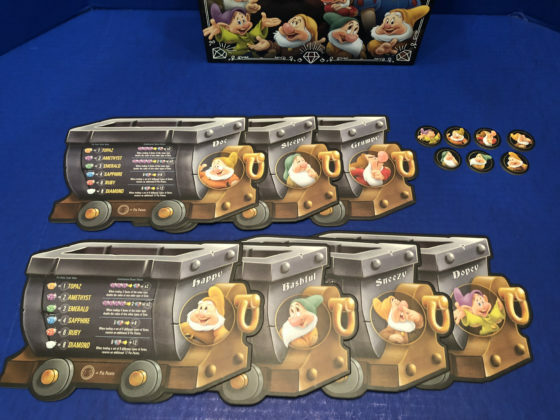 Each player is dealt 5 cards at the start of the game and additional cards are distributed at the end of each day, more if you are one of the last dwarfs to leave the mine. 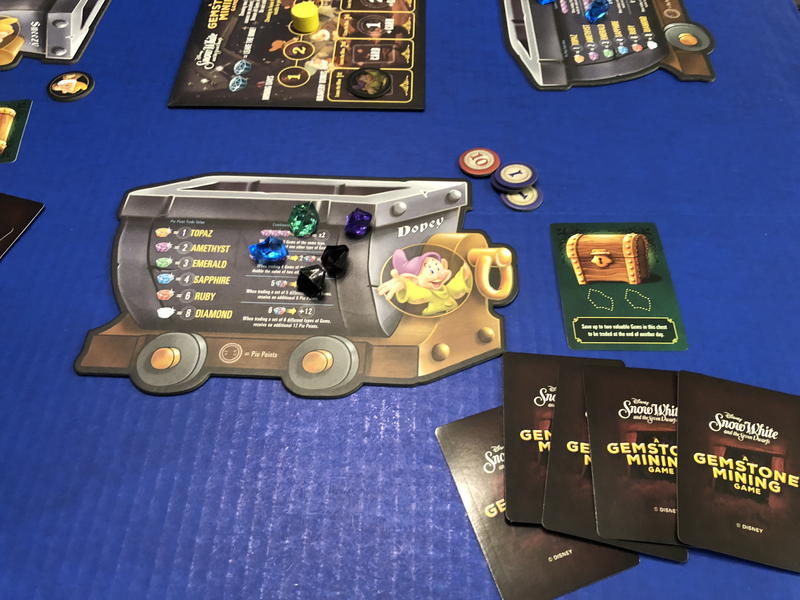 Having more cards gives players more options on their next turn. We played the game with four adults, which took about an hour to get through. 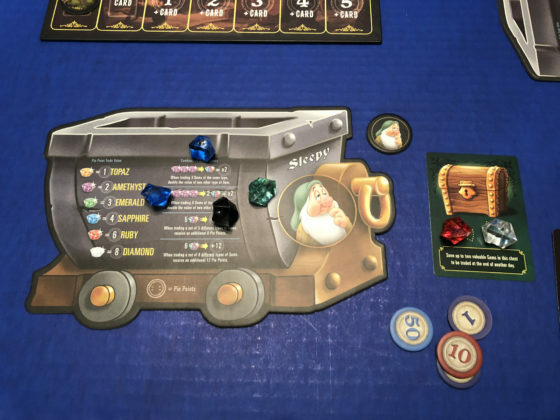 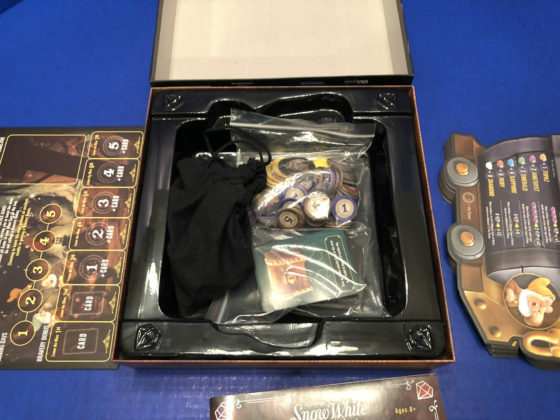 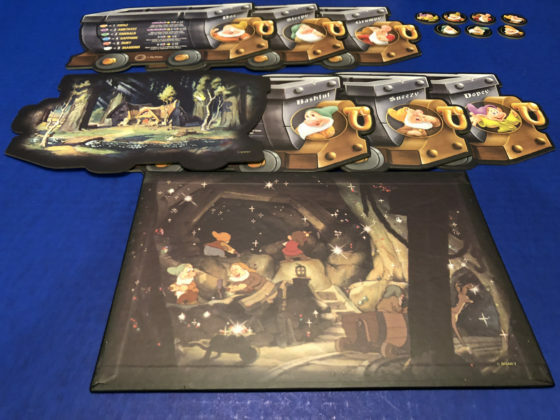 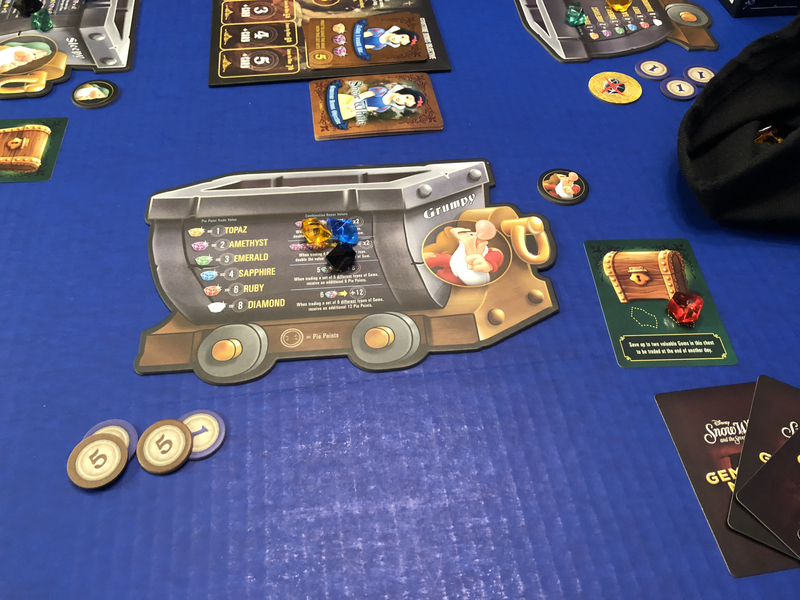 We all had more fun than we expected and Snow White and the Seven Dwarfs: A Gemstone Mining Game makes a perfect addition to game night for adults. 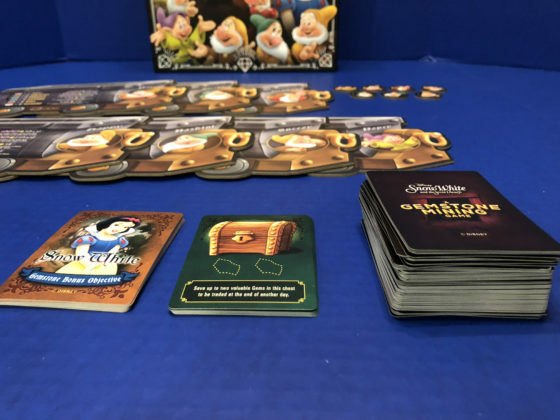 It may not have the unpredictable humor or crassness of Cards Against Humanity, but it nonetheless offers some laughable elements as players try to block each other from being the first to get Snow White’s pie points. 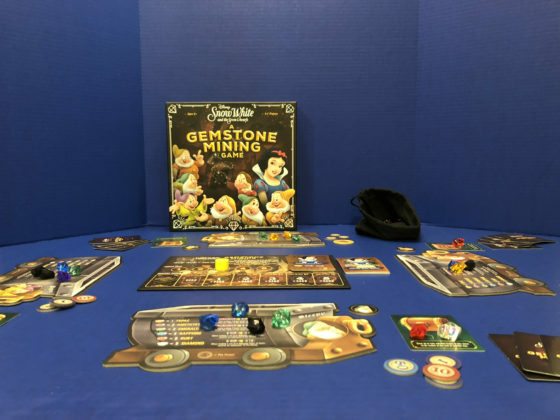 It’s also perfect for families as long as the kids are in 6th grade and up.